Location: Located 10 km. (6.2 mi.) 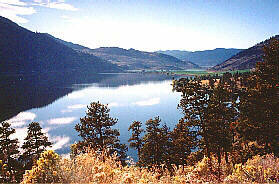 northeast of the town of Merritt via Hwy. #5A. Access from the city of Kamloops is also via Hwy. #5A. Fishing Report: Nicola supports a fair Rainbow and Kokanee fishery throughout the season. Rainbows go to 4 lbs. while Kokanee remain in the 1 lb. class. Trolling lures, flatfish, wedding bands and spinning gear are the most popular methods used, however flies are also successful. Ice fishing for Burbot during winter months is also enjoyed by many people. If you would like to have your business listed, please Click Here. Be sure to visit Fishbc.com for angling information! Viewscape: A beautiful setting, Nicola lies amongst rolling hills of sage, grass, and sparsely dotted Ponderosa pine. Marquart Lake - Marquart Lake, with a surface area of 23 ha. (57 ac.) is located due south from Nicola at an elevation of 1130 m. (3706 ft.). Travelling east from Merritt, access is via a secondary road heading east off Hwy. #5A. Distance from Merritt is approximately 13 km. (8 mi.). 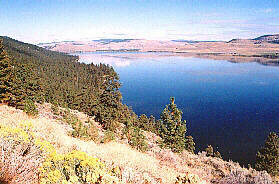 The best fishing time for Rainbow, Kokanee and Brookies is during the spring and fall months. These fish range between 1-2 lbs. A small 8 vehicle BCFS campsite with boat launching can be found on the lake. Lundbom Lake, about 46 ha. (114 ac.) in size, is found just 2 km. (1.2 mi.) east of Marquart. Once famous for its large quantities of huge Rainbows which reached double digit sizes, Lundbom has in recent years been hit hard by overfishing and abuse. However, this lake still remains very popular and is still capable of producing Rainbows in the 4-5 lb. class. 2 medium sized BCFS campsites with cartop boat launching are available on Lundbom. Weekend traffic can be very heavy so weekdays are better days to explore both Marquart and Lundbom.